We are going to be at Spring Greens following the theme of Something in the Air – On Sunday we will have a Demonstration Beehive on the stall. We would like some help running the stall and we are using SignUp.com to organise our upcoming activity. Please sign up for Spring Greens! Plans for the first Repair Cafe are proceeding – it will be on 6th July. We need offers from repairers please as well as things to repair! Here are the Minutes from our last Steering committee meeting – There is an open meetings on 13th June 7pm at Leominster Community Centre for all to attend. Last Wednesday evening, 3rd April 2019, more than 50 local people attended a Courtyard showing of the film Down To Earth. This beautiful and inspirational film is a collection of wise words from healers, visionaries and leaders around the world, all reflecting on our changing times – and our need to live a more connected life in this fast paced modern world. Put together by an American family seeking their own answers to the challenges ahead of us in a changing climate, the film is a celebration of human energy and the power and beauty of the natural world. Of those who came along to the film showing approximately half of the audience stayed behind after the film to join a brief reflection on the films message, and how we were affected by it – including our sense of ourselves as local ‘Keepers of the Earth’. Our discussions included an update for those present about the current activity of the Herefordshire Green Network and Extinction Rebellion from Kate Gathercole and David Gillam, as well as the inspiring news about Herefordshire Council’s recent unanimous Declaration of a Climate Emergency. Wye Ruin It? are also looking into the best candidates and have produced a more updated list for us, which you can find here. Their message is simple: our best chance to stop the bypass and get clean, smart and active transport is to Vote for Change on May 2nd. As Patricia Ronan from Wye Ruin it? has said; The Independents, It’s Our County and the Greens have agreed to work together to form a committee system, open and accountable. They will prioritise frequent, clean and affordable public transport and cycle networks, maintain existing roads and review any need for new roads until these things are in place. Not all candidates are on board and some from other parties are on board, but cannot say officially. Those who are not yet on board may well be swayed with public pressure, so please write to your local candidate and impress upon him/her the importance of working with the Alliance towards better future transport solutions. Wye Ruin it? have carried out extensive research to find out which of the candidates across the county are on board, or mostly on board with these principles and strongly recommend that they are supported. Please, please talk to everyone about these people and make sure to vote on May 2nd. This is the first time we have had a really good chance to change things in this county and there are many positive messages from the public in this respect. So, one big push and we can do it. If we get a good local government, national government will have to take heed. This is the start of national political change that will instil the will in the politicians to do the right thing. Coupled with major pressure from Extinction rebellion, this message has a very good chance of getting through. Jesse Norman keeps publishing great policies on transport, but he is still funding roads and not clean new technology transport. The budget priorities must change and financial support for new roads must be abandoned. Thanks Patricia! We don’t have long, so let’s go out and encourage people to vote the right people in! Today’s newsletter is mostly about the ongoing London action and our brave Herefordshire rebels who are doing amazing stuff, being arrested but still there – an inspiration to us all. 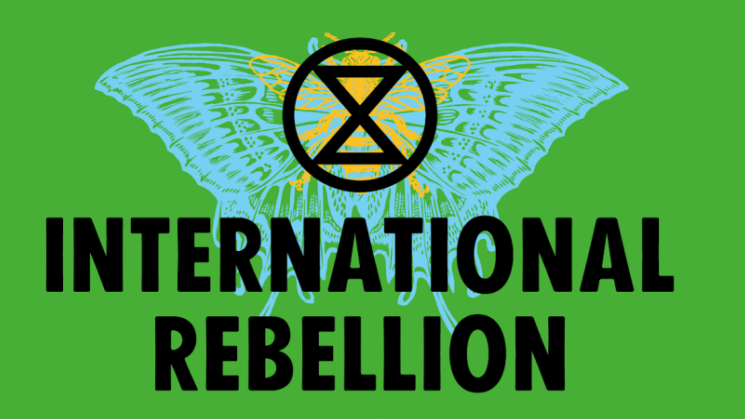 Over 70 people of all ages from Herefordshire are known to have joined Extinction Rebellion’s peaceful climate change protests in London. The protestors include members of the Hereford, Ross, Golden Valley and Kington Extinction Rebellion groups who joined the blockade at Oxford Circus. Activists have halted traffic and reached out to passing members of the public to communicate the urgency of the climate and ecological crisis. 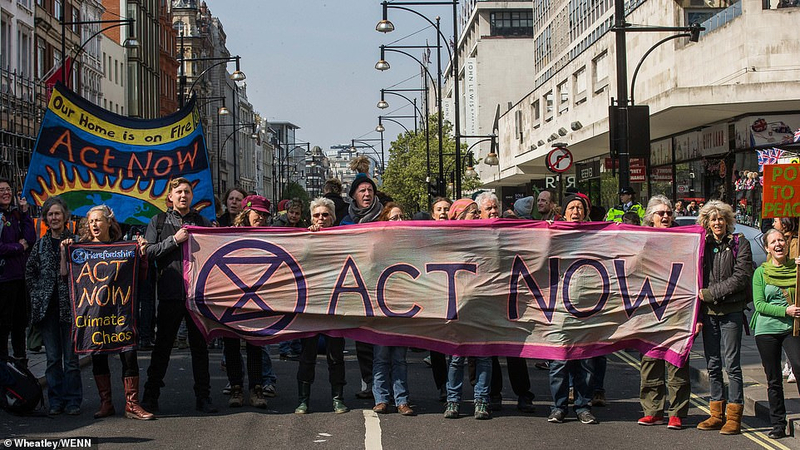 XR Herefordshire rebels on the march to Oxford Circus!“The protests have been totally peaceful and characterised by a good, almost festival, spirit but we are all utterly determined – the current crisis is humanity’s intelligence test. Do we listen to the scientists, act on our own observations and make the necessary changes or do we condemn our children and grandchildren to a massively impoverished future?” said Anastasia Calder, a member of the Hereford group present at Oxford Circus. While the police stood by for most of Monday, arrests have been increasing with passing days with nearly 400 made so far according to the BBC. Among these are 4 Herefordshire activists, Maggie Setterfield, Kate Bull, Jaz Grassie and Tamsyn Cowden. Kate Bull, one of the Kington group commented, “Time is running out and our situation requires strong and immediate action. History has shown us that non-violent direct action expedites social change – our actions with Extinction Rebellion follow in the footsteps of the suffragettes and all those who took action in the Civil Rights Movement in the United States to help make a better, fairer world”. On Wednesday, TV presenter and naturalist Chris Packham attended the Oxford Circus blockade to express his strong view that while inconveniencing the public with travel delays was regrettable, immediate and drastic action is needed to make the transition to a carbon-zero future. XR members Cathy and Clare There are signs that the protests are already having an impact with Environment Minister, Michael Gove, responding to the protests by saying that“we’ve got the message, we understand that action needs to be taken.”Extinction Rebellion have pledged that they will continue their protests to ensure that the Government does indeed act on the Minister’s words. Who doesn’t know and love this girl? She’s on her way to London and said she would love to join the XR rebels. Having been joined by the fabulous Dame Emma Thompson yesterday, who spoke from the ‘Tell the Truth’ boat, the rebels from Oxford Circus are tonight marching to Marble Arch, directing their energies towards the other locations, now that police have removed the boat from Oxford Circus.Meanwhile, about as far removed from London as you could get, XR Ludlow & Leominster had a stall at Aardvark Books Easter Fair in Brampton Bryan.XR Ludlow & Leominster stall at Brampton BryanAmidst the rolling hills and stunning Shropshire countryside, we took the XR message out to the villages. Great to engage with local people, most of whom, due to the XR actions in London and resulting rise in awareness, now know all about XR and our aims. Overwhelming support, in the main and a really positive and rewarding day 🙂 It feels like change is happening! A very encouraging meeting, with a packed room of XR members, farmers, councillors and representatives from renewable energy companies.amongst others. More details to follow in the next MailChimp newsletter – watch this space! Our thoughts and gratitude are with those holding the sites in London. Over the winter, we have been turning some of the wood from our coppice plots into charcoal. 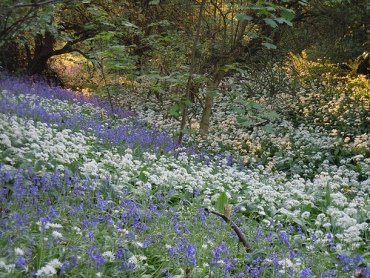 From the early middle-ages, until quite recently the great majority of lowland mixed woods have been treated as coppice or coppice-with-standards. Most coppices were cut on rotations of 5–30 years, supplying mainly local markets with fuelwood, charcoal, fencing, tanning bark etc. They were also the basis for numerous greenwood crafts. Timber trees, known as standards, grew in varying densities amongst the coppice for 80–100 years. Oak timber for example was often used to frame houses. The coppice workers of old, would carefully manage their areas of woodland known as “coupes” (from the French verb “to cut”) whilst they were still growing, to ensure they earned the best yield when eventually cut on the next rotation. This was often an investment of time (and money) on a return which might not be realised for another 30 years! Today, most of the historical markets for coppice products have declined markedly. However, there is growing interest in the wildlife/economic value of coppice management and some of their associated traditional crafts. Local demand for firewood, barbecue charcoal, fencing and garden products can offer some financial return on the coppicing as well as the obvious wildlife benefits. There are also opportunities for skills training, wellbeing programmes and recreation, all of which can help woodland owners or workers, biodiversity, people’s experience of woodland and sustain local economies. Charcoal is a valuable way of adding value to small roundwood which comes from coppicing. It is made by the controlled burning of wood, to generate heat but with a restricted air supply during the process. The heat causes water and volatile compounds to be driven out, from most of the remaining wood in the kiln to leave just carbon (charcoal). When used as fuel, charcoal burns with very little smoke and at about twice the temperature of wood. Nowadays almost all the charcoal produced in this country is sold and used for cooking on barbeques. In a new initiative this year, we have started making barbecue charcoal here at Queenswood Country Park and Arboretum. The wood is being sourced from Queenswood’s very own coppice plots and we are using a traditional cast iron ring kiln, which the Trust has owned for several years. There is a history of charcoal making here, as an archaeological survey of the Queenswood revealed evidence of a historic charcoal platform, coincidentally not very far from where our kiln and coppice plots are located today, in South Wood. Our first batch of charcoal was made under the guidance of Reserves Officer, Lewis Goldwater who has previously made and sold charcoal for his own company, Turnham Green Wood and for Gloucestershire Wildlife Trust. However, we now want to enlist some of our volunteers to assist us with the production and delivery of our charcoal, to what we hope will be a broader customer base. If you are that person and have long wanted to learn this historic craft of charcoal making then please get in contact with Rachel (r.hibberd@herefordshirewt.co.uk), or Lewis (l.goldwater@herefordshirewt.co.uk). Extinction Rebellion is just common sense – but what is the best response? The related extinction and climate crises that are threatening the survival of life on earth can only be solved by reducing our ecological footprint – systematically curbing impacts and repairing nature to a level that sustains us within the planet’s means. “We are facing a climate catastrophe.” These are not just the words of tree-hugging Gaia-worshippers. They were said this week by the Legal & General insurance company, the UK’s largest money manager, which last year blacklisted many companies for being unsustainable. “As financial policymakers and prudential supervisors we cannot ignore the obvious physical risks before our eyes. Climate change is a global problem,” they said in a statement. Mark Carney, the governor of the Bank of England, and Villeroy de Galhau, the governor of the Banque de France, said the same in an article in the UK Guardian newspaper this week, as they called upon financial institutions everywhere “to raise the bar to address… climate-related risks and to “green” the financial system”. The wave of protests sweeping around cities across the world – International Extinction Rebellion – is simply asking for common sense to prevail in the face of the overwhelming threats facing the planet. The plain fact is that all money spent everywhere must now be only spent sustainably: to meet our needs while also rebuilding & repairing our planet. Not unlike the immediate French and worldwide response to the devastation of Notre Dame Cathedral, we must all, especially our leaders, pledge to take urgent action. Watching this global icon go up in flames has struck the hearts and souls of people around the world; within a few days almost €1 billion have been pledged to rebuild it. The movement’s articulate young visionary, Greta Thunberg, told an assembly of European members of parliament this week: “We need cathedral-like thinking”. As she was speaking, and all this week, the streets of European cities are being blocked by Extinction Rebellion protesters, who have pledged not to stop blocking traffic until their demands are met. Some city leaders are already responding. About 100 cities and towns in the UK have already passed resolutions declaring a climate emergency. The website climatemobilisation.org is attempting to keep track of all cities in Switzerland, North America, Australia and the UK which have done so and has so far logged about 460 of them, including 18 in Australia, such as Darebin, Yarra, Vincent, Victoria, Gawler, Mariby, Hawkesbury and Adelaide Hills. In California, Los Angeles, Berkeley, Richmond, Oakland and Santa Cruz have also done this, to name but a few. The question for everybody, is what does a council do to follow up, having passed the resolution? To meet the demands of the resolution they have to become carbon neutral by 2030 at the latest. 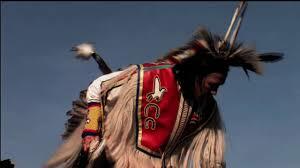 They also have to include the population in their decision-making. This will necessitate action on many fronts. All towns, regions and cities must become ‘one planet’. A campaign is beginning to persuade cities, towns and communities to declare “one planet” status that allows them to plan and track a path into the “safe and just space” defined by the work of Kate Raworth and others, where the basic needs of citizens are met without damaging the planet. The framework proposed is a way for any town and city to work out how to #MoveTheDate of their Earth Overshoot Day (a measure of unsustainability) to become more and more sustainable over time using a framework like this. I am beginning in my own part of the world with #OnePlanetSwansea, #OnePlanetCarmarthen and #OnePlanetLlandeilo. Work is underway to tackle Cardiff, the capital of Wales. You can start this process in your own town, wherever you live. The aim is to make all cities regenerative, based on circular economies and renewable energy, to ensure we live within our means. The solutions already exist. Policies to support them must be based on evidence, not upon ideology, belief systems or loyalties, because we are all in this together. Policymaking has not caught up with the fact that humanity crossed the threshold of “one planet” living and began living in deficit way back at the beginning of the 1970s. This is why we need data, indicators and a coherent plan to relate our activities to what the biosphere of our planet can tolerate. Hold a series of public meetings and online and off-line consultations to explain the context and aims in order to obtain feedback and community buy-in. These will include a methodology and accounting system and be applicable to all sectors such as soils, biodiversity, water, energy, buildings, transport, well-being, etc. They must include ecological footprinting. Use data and surveys to ascertain the starting point from which goals will be set: On the supply side, the productivity of its ecological biocapacity (greenspace and water bodies). On the demand side, the ecological footprint – assets/resources required to produce the natural resources and services it consumes. A system similar to that applied by the UK Climate Change Act could be adopted, along with the Global Footprint Network’s Net Present Value Plus (NPV+) tool to test the results of different scenarios. A set of five year plans may result, each with a budget and a set of targets. The overall target could be, say, 30-40 years away, to meet everybody’s basic needs within planetary limits. Each short-term target will be a step closer to the overall one. Each sector (biocapacity, water, food, energy, buildings, transport, industry, etc.) will have its own schedule. This should be based on what data is easy and cost-effective to gather, and relate to the baseline situation, chosen metrics and sector targets. The data should be transparent and publicly available. Everybody should be able to view the progress being made. If a population’s ecological footprint exceeds the region’s biocapacity, that region runs an ecological deficit. …which almost all regions now do. A region in ecological deficit meets demand by importing, liquidating its own ecological assets (such as overfishing), and/or emitting carbon dioxide into the atmosphere. It must therefore identify the origins, destinations and impacts of consumption. It would then be possible to model the effects of changes of policy and practice towards a circular economy upon the related biocapacity. Tracking the Human Development Index (a measure of how human needs are being satisfied) against the ecological footprint over a time period can indicate the direction of progress. Government agencies at all levels can manage their capital investments in a fiscally responsible and environmentally sustainable way by using ecological footprint accounting and the Global Footprint Network’s Net Present Value Plus (NPV+) tool. The traditional net present value (NPV) formula used by economists adds up revenue and expenditures over a period of time and discounts those cash flows by the cost of money (an interest rate), revealing the lifetime value of an investment in present terms. GFN’s NPV+ tool adds to this calculation currently unpriced factors, such as the cost of environmental degradation, and benefits like ecological resiliency. All costs and benefits – even those where no monetary exchange occurs – thereby can be seen as “cash flows”, and can be evaluated using different future scenarios. This will provide a more accurate and useful guidance on the long-term value of the investment, because it makes reference to the ecological footprint of the project in question. The ecological footprint can therefore help to identify which issues need to be addressed most urgently to generate political will and guide policy action. It can improve understanding of the problems, enable comparisons across regions and raise stakeholder awareness. By identifying footprint “hot-spots”, policymakers can prioritise policies and actions, often in the context of a broader sustainability policy. Footprint time trends and projections can be used to monitor the short- and longterm effectiveness of policies. By understanding where the best long-term value is, policies can be oriented toward better outcomes, building wealth, avoiding stranded assets and leaving a better legacy for future generations. The standard PAS 2070 can assist with monitoring cities’ carbon footprints of consumption and production. ISO standards cover environmental management, energy management and life-cycle analysis to help put in place procedures for reducing impacts. At the same time, all citizens and politicians need to do more to raise awareness about the issues. If you want support in doing this in your neighbourhood, get in touch. We can do this. It just needs a massive, concerted effort. On the 4th of May, at midday, we will be repeating the Elevator Pitch we made yesterday at our Gathering. Come and enjoy fantastic activities in a beautiful setting. Read all about it here!